Victory! With the destruction of the Death Star, the Rebellion has given hope to a galaxy living in fear. Having lost their ultimate weapon, the Empire scrambles to recover in the face of this crushing defeat. As the scattered fragments of the battle station rain down upon the Rebel base on Yavin 4, the Empire sets in motion a plan to seek retribution against Rebel forces stationed on the small moon. 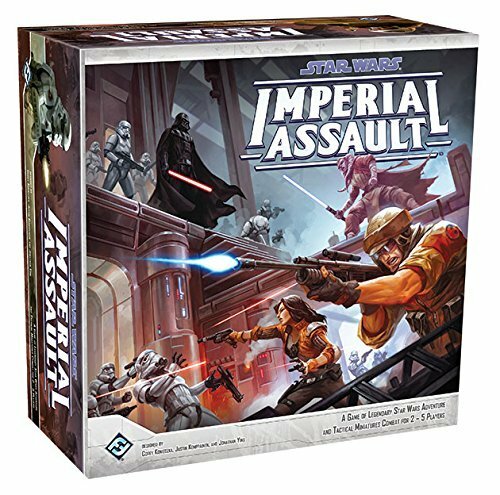 In Imperial Assault, 2-5 players join forces in an epic Star Wars adventure based on the Descent 2.0 system of combat and dungeon exploration. One player will control the Galactic Empire, pitting the Rebel Alliance against squadrons of Stormtroopers, deadly beasts, and even Darth Vader himself. The other players take control of Rebel Alliance Heroes, going on missions to continue their fight against the Empire. Can the Rebel Alliance work together to accomplish their missions, or will the Empire bring its forces to bear and squash the Rebellion? Find out in Imperial Assault!